Posted in: Corporate Fascism, Kleptocracy. Tagged: boiler room, boiler rooms, corporate greed, crony capitalism, crowdfund investing, crowdfunding, employment, fascism, h.r. 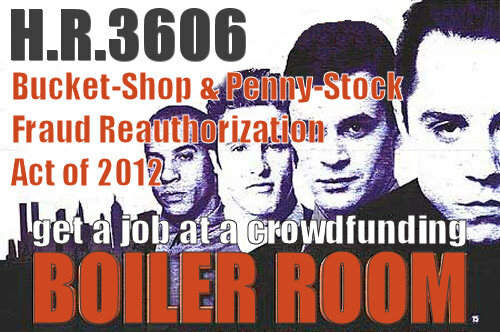 3606, hr 3606, hr3606, jobs, jobs act, jobs act of 2012, jumpstart our business startups, kleptocracy, occupy wall street, ows, penny stock fraud, political corruption, small business, startups, vvv pr. Former SEC Chief Accountant warns that the JOBS Act – sponsored by one of the most corrupt Congressmen in Washington – won’t increase employment but will simplify swindling. Personally, I’d wager that the only jobs created by the JOBS Act of 2012 will be for Wall Street brokers who didn’t meet quota and other con artists pitching worthless penny stocks from telemarketing boiler rooms and Internet scam sites. This document may contain links shortened using http://tinyurl.com to facilitate emailing. If you are concerned we might use them to cloak phishing or malware, we recommend you open them with this: http://longurl.org. Also our thanks to the miami web designs, miami web designers and miami web developers that support our efforts.